This life is full of experiences that can become adventures that we didn’t plan on….like my craft room. These next few posts are my diaries of my experience building my craft room from scratch. What an adventure! I am a self-proclaimed DIY junkie. All of the tools in the house are mine. I love trying and learning how to do new things. My most recent build was this doll house pictured above for a spunky 10 year old’s American Girl dolls. I knew someday I would apply my knowledge and skills to building a craft room. We recently built a house and in that house we built a room right off the kitchen just for me. I knew exactly what I wanted to do with it even before it was on the blueprints and I knew I wanted to work with Sandra of sawdustgirl.com. For years I have followed Sandra’s blog. She is amazingly talented, inspirational, quite funny and I just wanted to glean whatever I could from her. 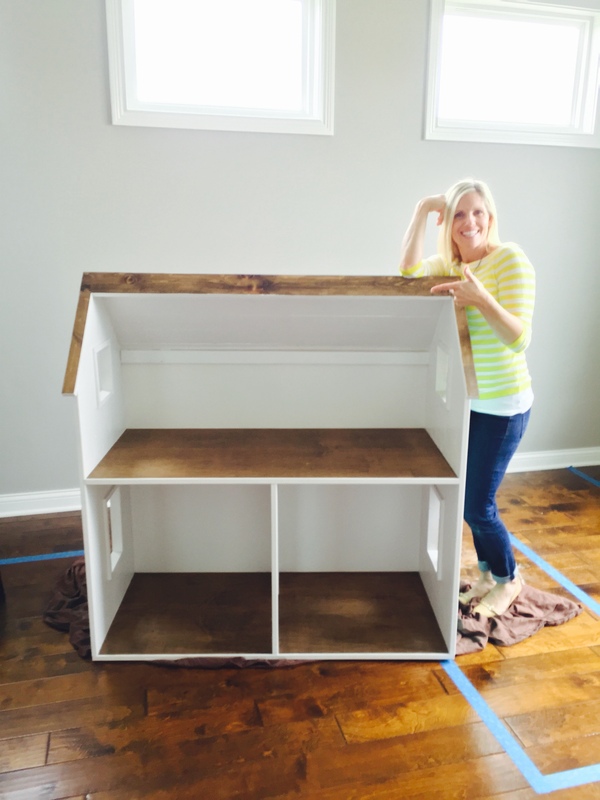 I have followed her blog for so long that I feel like I know her and when I contacted her she was willing to take me on as a client and mentor me through the process as I have never built cabinets, drawers, drawer fronts, etc. before. This room built off of the kitchen is lovingly called “the craft room” although there is yet a craft to be made in there! The entire family calls it “the craft room”. And it is ALL MINE! This space that is all mine, however, will also house our home computer and family files, our family printer, a homework and school project spot AND all of my crafts as well as the crafts of an excited, creative 10 year old. I have been crafting my whole life and have a plethora of “crafty” things. If you need a pair of scissors whose only function is to shred things to make confetti, I’ve got that!!! Over the years I have had a closet here for scrapbooking supplies, another closet there for my Cricut and all of the cartridges (before it all went digital and wireless), a few shelves there to hold my sewing things, a spot for wrapping paper and all of those adorable accessories to adorn the perfectly wrapped gifts with…..you know what I am talking about if you craft and you probably have a similar set up. The list goes on and on. I wanted ONE place where I could have it all neatly organized and could find anything I needed easily. A place for everything and everything in its place. So, I dove in, head first. Alone and really uneasy. I remembered that I had an amazing mentor to talk to about the process. I talked with her about the room’s function and what my ideas were over a few sessions on Skype. We don’t live near eachother so all of the brainstorming, planning, etc. had to be done on-screen. I have 10’ ceilings in this house so I decided I wanted floor to ceiling cabinets, a desk for the computer, deep drawers for things, file drawers, a cabinet to house the printer and office/school supplies, more drawers for more things, fabric storage, a bench seat with storage, standing sewing mat storage, a sewing machine table for my sewing machine and serger and a large peninsula for crafting, scrapbooking, homework, cutting and pinning fabric and whatever else comes to mind! The jumping off point for me in this room was a set of antique card catalogs that I picked up on Craigslist. I thought they would be perfect for all of the little tools and embellishments I had collected over the years. I told Sandra that I thought I would be able to realistically be done from beginning to end in 16 weeks and right now it is June 1. Considering the fact that 1. I had my 4 children home (plus all of their friends) for the summer who would demand my time (love you) and 2. I had never done this before, she thought that was a good and realistic timeline. She told me that building an ENTIRE room was very ambitious and she was as eager as I was to see how this would go. She was also sure that I could do it. We devised a plan for the first cabinet. I was expecting Sandra to give me a computer generated layout for whole room and I would be able to just follow the measurements and be done quickly. That, however, was not her plan. Sandra suggested that I start with the first cabinet and then build my room from there. She had found that when she built HER rooms that this was the best way to do it and left a lot of flexibility to change things on a whim. She gave me a drawn up plan for the one cabinet and I got to work! I mapped out the whole layout that I was considering with tape on the floor to see how it felt in the space. This way I was able to adjust my measurements and placement before actually cutting and had visual idea of how big it actually was going to be in the space.